Bespoke your bike at Norwich market! Pushing Ahead are taking over stalls 14-15 at Norwich market from 13th – 19th August with everything you need to change your bike into a bespoke creation. The stalls will be open from 11am – 4.30pm from Mon 13th through Sat 18th, and will be open on Sunday 19th from 11am – 3.pm. 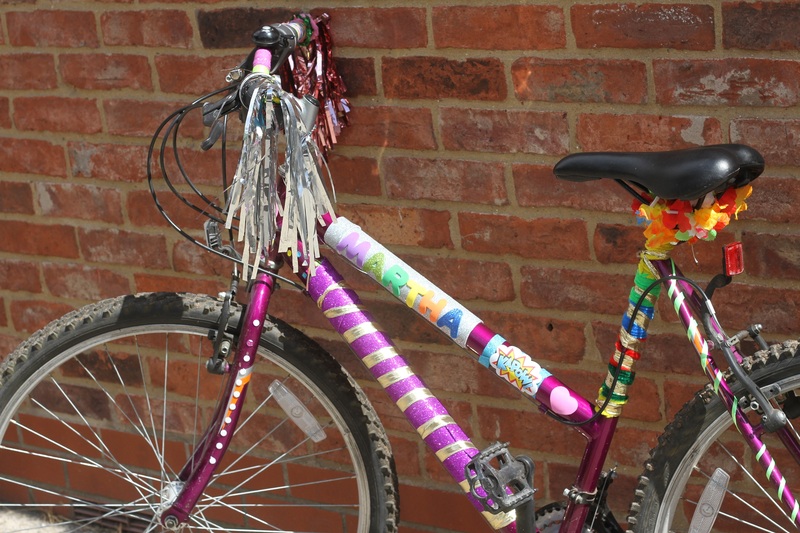 Children are invited to bring along their bikes to this FREE #stylemybike pop up stall, where they will have the opportunity to use all materials provided to bespoke their bike. Families with bikes are welcome to come along too! Whether it’s glitter, stickers, paint, wobbly eyes, ribbon, flowers etc, we have something for every personality and style. And, don’t worry if you’re stuck for creative ideas as we have some fab art students on hand to help. And if you share a picture of your styled up bike to social media with the hashtag #stylemybike on the day, the most fabulous cycle makeover will win a £50 shopping voucher! Pushing Ahead will also be on hand to answer any questions you may have about cycling in Norfolk, including our free cycle loan scheme – perfect for the summer holidays. Cycle Republic will be on the stand Weds and Thursday 12-3pm offering free bike maintenance so you can sure your bike is fit for summer riding. FUNdamental Cycle Skills Activities are taking place in Chapelfield Gardens. For this activity meet at the Bandstand in Chapelfield Gardens at the beginning of the session time. It will involve a series of fun challenges whilst teaching basic skills & control of the bike. Participants need to bring their own bike, but you not have to be able to ride a bike. Max 8 places – all ages. These must be pre-booked by emailing pushingahead@norfolk.gov.ukand be quick as these sessions always go fast. After the session, the trainers will take you back to the market stall where you can bespoke your bike!